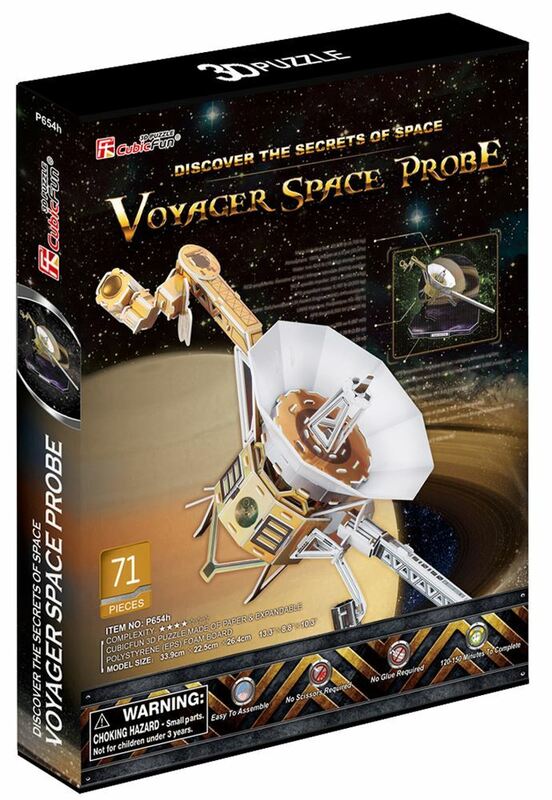 The Voyager programs is an American scientific program that employs two robotic probes, Voyager 1 and Voyager 2 to study the outer Solar System. The probes were launched in 1977 to take advantage of a favourable alignment of Jupier, Saturn, Uranus and Neptune. Although their original mission was to study only the planetary systems of Jupiter and Saturn, Voyager 2 continued onto Uranus and Nepture. The Voyagers now explore the outer boundary of the heliosphere in interstellar space, their mission has been extended three times and they continue to transmit useful scientific data. Neither Uranus nor Nepture have been visited by a probe other than Voyager 2. This 3D Puzzle is made of paper and expandable polystyrene foam board, it is easy to assemble without the use of any other tools or glue. No of Pieces: 71 Model Size: 33.9cm x 22.5cm x 26.4cm. Age: 8+ years.